Red mangrove propagules are seedlings. They take root when the reddish-brown ends are planted into a bank's shoreline. Volunteers recently planted 10,000 red mangroves along North Spreader Canal in Lee County. Biologists are concerned the canal’s bank is eroding. That’s because the Florida Department of Environmental Protection has been removing nonnative plant species from the land. 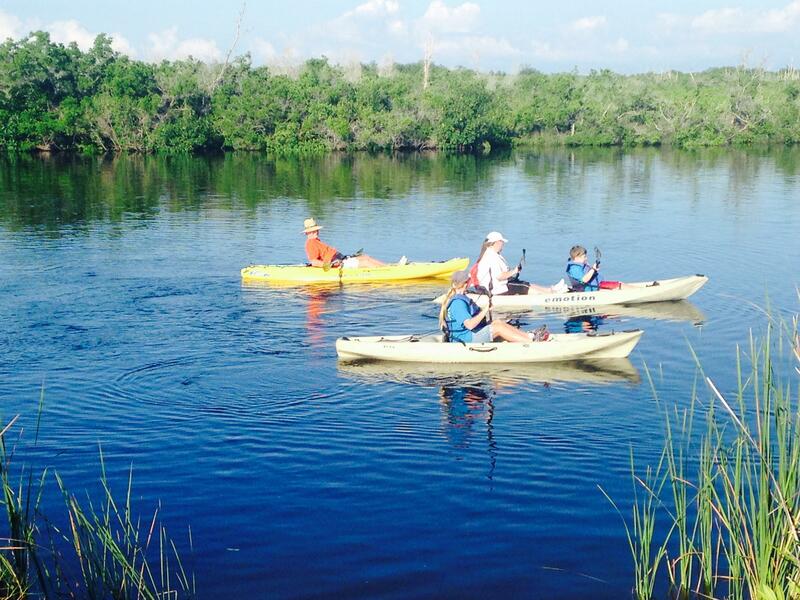 More than a hundred volunteers launched their vessels into the Cape Coral canal. The water was covered with kayaks—a medley of orange, red, yellow, blue and green. About 150 local volunteers planted all 10,000 red mangrove propagules in two hours. David Scott is a biologist. He's also on the board of the event’s organizer Keep Lee County Beautiful, a local nonprofit. 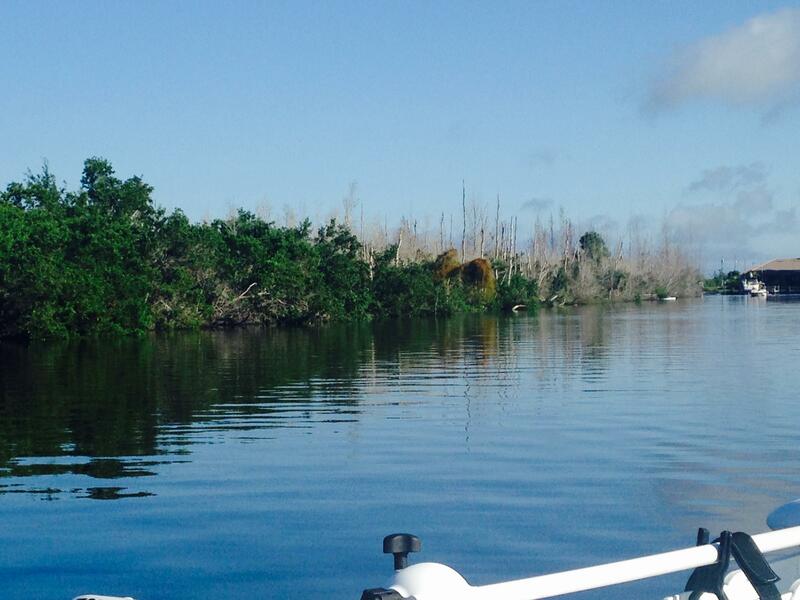 Scott said biologists consider red mangroves to be Florida’s most valuable natural resource. "This creates a habitat for hundreds of different fish species in their juvenile stage, as well as a substrate for oysters to grow on. The red mangrove is a buffer for storm surge." said Scott. "So on any count, the red mangrove is an incredibly valuable tree." A few ferries gave rides to mangrove planters who didn’t have kayaks. I got on a boat that only fit about eight people. After chugging along for 15 minutes, the lush green shrubbery to our left began fading into dry brown branches. Kayaks floated along the patch of barren brush. 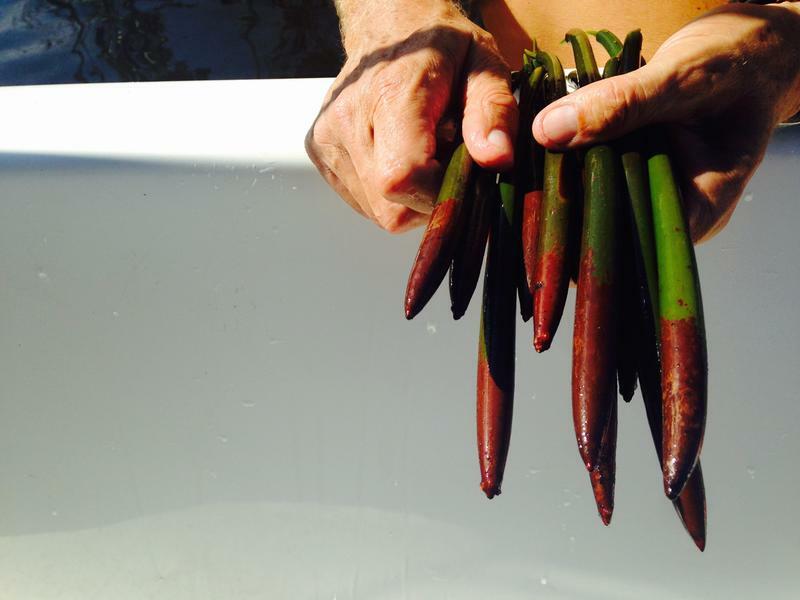 And volunteers were waist-deep in the water-- red mangrove propagules in-hand. Propagules are seedlings that kind of look like asparagus, but with reddish-brown tips. "If you look closely at these propagules, you'll see that this is the root end right here which is the end you're gonna plant in the soil," said biologist and organizer Terry Tattar, pointing to the reddish-brown end of the seedling. He showed our boat of volunteers how to plant the propagules. Tattar said to push it into the shoreline about two-thirds of the way in. Then plant the next one just a few inches away, and so on. The dry patch of land in the distance is where the planting took place. Exotic plant species like Melaleucas, Brazilian peppers and Australian pines invaded the bank along North Spreader Canal. The Florida Department of Environmental Protection has been eradicating the nonnative species. And biologists are concerned the plants' absence could erode the bank, which inspired the "Mangrove Mania" event. Tattar gave each volunteer a bag of propagules. Fort Myers volunteer Dennie Hamilton got a bag, and I followed him off the boat into the water. "We're walking through just brush along the edge of the canal, trying to make our way toward a planting area," said Hamilton. Planting areas were marked with orange bands. Hamilton found an open sandy spot. He reached into his bag of propagules and began planting. "I think there's a 150 and so I’ll just do these and maybe get another bag and start over again," said Hamilton. "It's just a good community activity. It's important to do these kinds of things in the community." Biologist David Scott said he was happy with the day’s turnout. "I think this is a beautiful thing that we get the neighborhood-- all these people," said Scott. "We have an increased responsibility now in this area." Keep Lee County Beautiful hopes to make this an annual event, but it won't always be at the same location. "I believe it's our moral responsibility to really get these guys going in as many places that make sense, biologically," said Scott. The volunteers planted all 10,000 red mangrove propagules along the canal, replacing the exotic species that were recently removed. Biologist David Scott said they’ll start taking root in just two days. But his work in that bank is not finished. 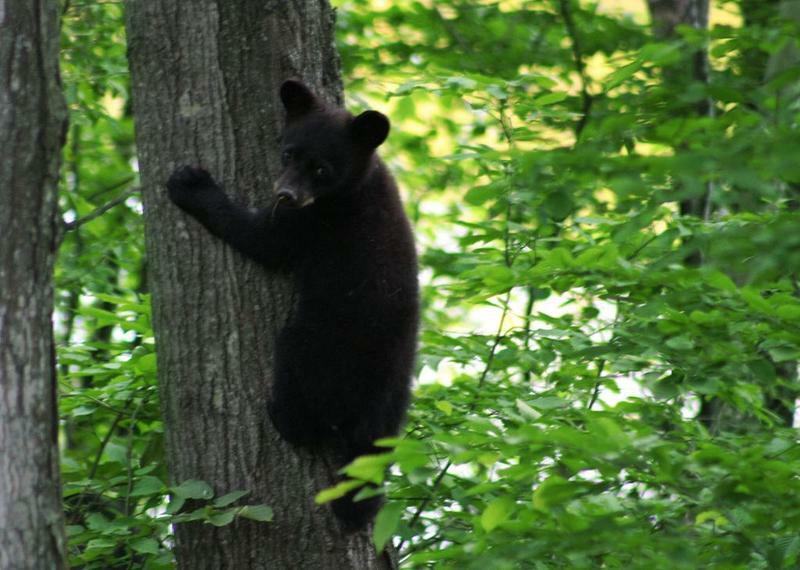 He plans to return regularly with a group of local students to check on them. Scott wants the next generation to study alongside this new wave of red mangroves. Click the video below to watch the "Mangrove Mania" event in Lee County. 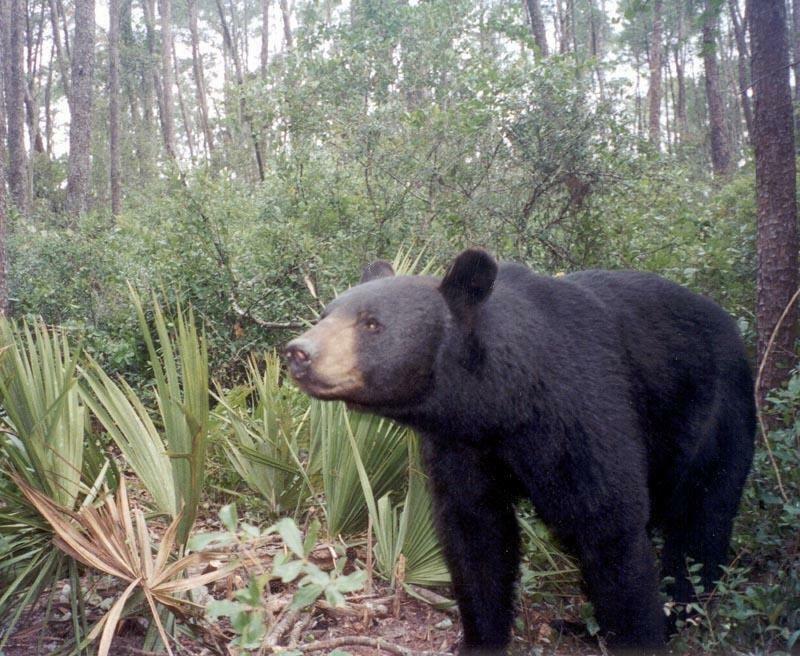 It’s been 20 years since Florida’s last bear hunt, and environmentalists opposed to the hunt are seeking volunteers to monitor hunters, to make sure everything is being done by the books. Speak Up Wekiva is seeking volunteers to photograph vehicle license plates of hunters to ensure those hunters are permitted to participate. Mote Marine Laboratory detected low levels of the potentially harmful algae “red tide” along Sarasota County’s coastline this week. 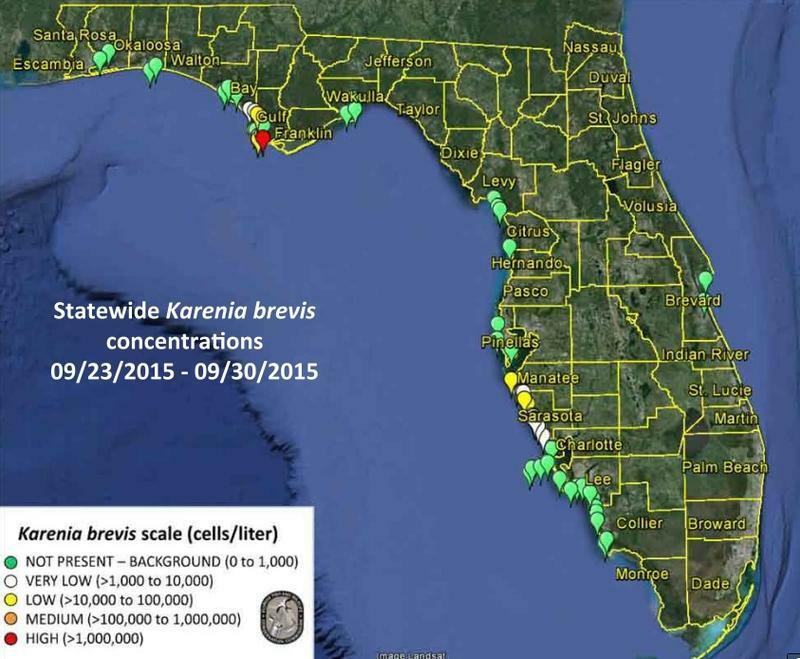 Red tide toxins are always present in the Gulf of Mexico, but this discovery had more than normal levels. High levels of red tide could kill fish and cause respiratory problems in people. But beach goers do not have reason to worry, yet. 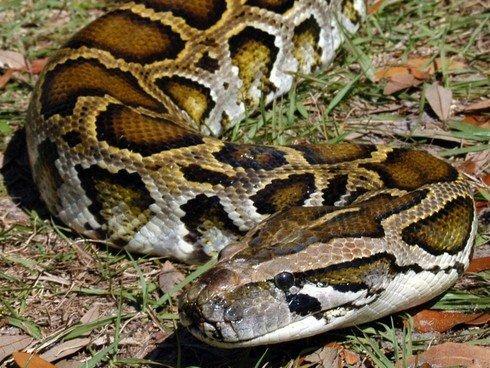 Registration begins soon for the Python Challenge, which encourages hunters to kill or capture pythons in the Everglades for cash prizes.